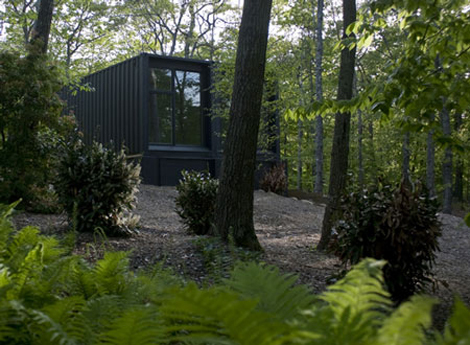 Shipping Container Studio by MB Architecture | A contemporary gallery of art, design, film and music. There’s a lot of great shipping container architecture out there. I especially like how this art studio maximizes the the space by using two containers positioned next to each other on a foundation wall and creates a high ceiling in the back by digging out a basement. More photos and drawings through the link. It looks like a real cabin made out of wood and glass! You can’t even see it’s a shipping container unless you go in for a closer inspection. Great idea here!